TV White Spaces are those portions of UHF terrestrial television spectrum that are not used by broadcasters at a specific location. These frequencies have useful characteristics, allowing them to travel longer distances than cellular frequencies, and also have better in-building penetration. Suitable low power devices can be used to build a network without causing any interference to TV broadcasters or their viewers. However, as these devices are not yet in mainstream usage, they remain very expensive, which is a significant obstacle to using them to provide low-cost connectivity to the rural poor. AfriCanopy’s solution to this is to use advanced Wi-Fi devices to connect people’s cellphones or tablets in the immediate location of the TVWS device, and to create a mesh Wi-Fi network to connect neighbouring villages too. AfriCanopy (Pty) Ltd is committed to providing low-cost high-speed Internet access to rural South Africa. AfriCanopy intends on accomplishing this using its own highly innovative Television White Space (TVWS) and Mesh Wi-Fi solution. AfriCanopy applied for and recently received a Commercial Television White Space Trial Licence from the Independent Communications Authority of South Africa (ICASA). 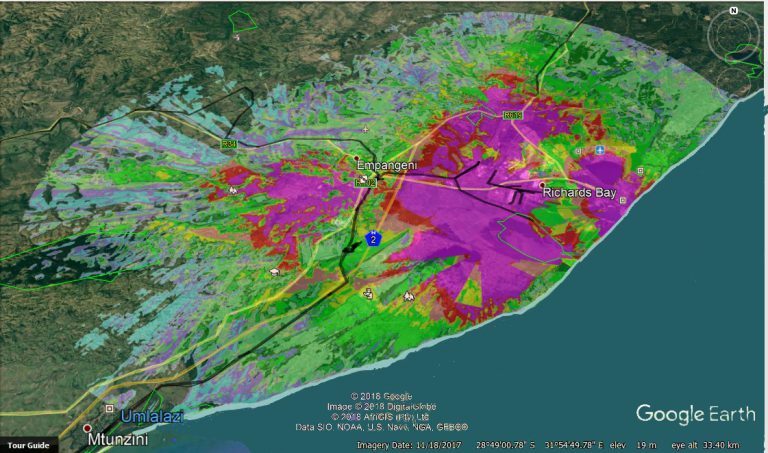 The licence enables AfriCanopy to test its TVWS and Mesh Wi-Fi solution in the King Cetshwayo District Municipality in the Kwa-Zulu Natal. AfriCanopy’s solution comes in the form of TVWS and Wi-Fi Mesh Networks as illustrated by the image below. The network consists of a Fibre Point of Presence, a single Hub Station, 4 Base Stations, Primary Entrepreneurs and Secondary Entrepreneurs. The central Hub Station is linked to the nearby fibre Point of Presence with a TVWS Point to Point (PtP) link. The central Hub Station has a TVWS PtP link to each of four Base Stations. Each of the four Base Stations provides TVWS coverage to a radius of up to 20 km. Both the Base Stations and Hub Station send and receive signals from carefully selected TVWS radios and antennas located at the top of highly innovative rapidly deployable masts. Local community members living within the 20 km base station TVWS coverage radius can apply to become Primary Entrepreneurs. Local entrepreneurs living within a 1 – 5 km radius of Primary Entrepreneurs can apply to become Secondary Entrepreneurs. Suitable Primary Entrepreneurs will be provided with Primary Customer Premise Equipment (CPE) and other equipment and can be said to be Primary Business in a Box (BiaB) owners; and suitable Secondary Entrepreneurs will be provided with Secondary Entrepreneur equipment and can be said to be Secondary Business in a Box owners. The CPE consists of carefully selected TVWS equipment. In addition, a Wi-Fi telephone, mobile charging ports, a solar power supply and one or more custom Wi-Fi Mesh Network devices are provided as part of the BiaB. Each Wi-Fi device provides coverage for users nearby, as well as forming a Wi-Fi Mesh network (using additional internal radios) with other Wi-Fi devices. The TVWS signal transmitted from the four Base Stations’ masts is picked up by Primary Entrepreneurs’ CPE, connected to the Wi-Fi device, which creates a 180 m radius Wi-Fi hotspot. A separate Wi-Fi signal from the Primary Entrepreneur’s Wi-Fi device is picked up by Secondary Entrepreneurs’ Wi-Fi devices and another Wi-Fi hotspot is created around the Secondary Entrepreneurs. Additional Secondary Entrepreneurs can in turn connect to these Wi-Fi devices. 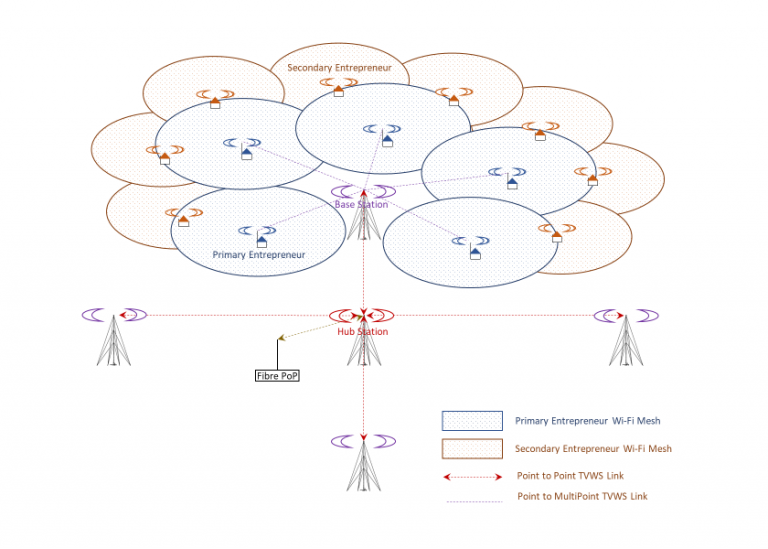 In this manner, the aggregated result of multiple Primary and Secondary Entrepreneurs is the formation of a community wide Wi-Fi Mesh network, which uses the TVWS network as its backhaul. In addition, it allows Wi-Fi coverage to be provided in places where the TVWS signal is not available, such as behind hills. Through the Wi-Fi Mesh network, members of the community within the Mesh network will have full broadband coverage. Community members will be able to use the broadband on a low cost per MB basis which they may use: as mobile data, to make voice calls, or simply to access the Internet via either a mobile device, a tablet or a personal computer. Voice usage for community members communicating with each other when both are within the Mesh network will be free. Data usage by community members using the Internet or communicating with users outside of the mesh network will be significantly less than the cost per MB offered by other major service providers. Importantly, data will be offered at a flat rate, so that small purchases are not penalised by paying a higher price. Schools within the Wi-Fi network will be provided with a completely free broadband connection. Community members will be able to purchase mobile data and voice on a prepaid basis from any primary or secondary entrepreneur, as well as other outlets. The Primary and Secondary BiaBs will include a mechanism which will enable them to sell data and voice. Primary and Secondary Entrepreneurs will receive a 20% commission on all voice and data sales. Furthermore, Primary and Secondary Entrepreneurs will be provided with a payphone with which they will be able to charge community members to make calls. AfriCanopy’s objective is to create steady income earning opportunities for willing entrepreneurs within the community. The project will take place within the King Cetshwayo District Municipality. Suitable locations for the siting of the base station masts have already been identified to enable the rapid deployment of the solution should the application be granted. Figure 3 illustrates the projected coverage area and estimated broadband speeds which will be achieved by the Trial Project. The light blue areas represent broadband speeds of approximately 5 Mbps, the light green areas represent speeds of approximately 20 Mbps, the dark green areas represent speeds of approximately 35 Mbps and the purple areas represent speeds of up to 50 Mbps.